German rabbi; born at Leipnik, Moravia, 1639; died in Worms Jan. 1, 1702. At the age of twelve he came with his father, Samson, to Worms (1653), and two years later married Särlan, the daughter of Sussman Brilin. Under Brilin and his son Isaac, Bacharach continued his studies for seven years longer. In 1660 he received his rabbinical license from Mendel Bass, rabbi of Frankfort-on-the-Main. He seems to have been for some time rabbi of Mayence. In 1666 he was made rabbi of Coblenz, but for a reason unknown he was not reelected in 1669. The law of Coblenz demanded (possibly for purposes of exaction) that the rabbi be reelected every three years. He returned to Worms, where he lived as a private member of the community, and lectured on Talmudic topics. His father had hoped to see him made his successor, but the congregation, pretending that it was contrary to its laws to choose a rabbi from among the residents of the community, elected Aaron Teomim Fränkel. Jair Ḥayyim felt very much slighted by this, and it was evidently for this reason that he wrote, under the same title, a severe criticism of "Maṭṭeh Aharon" (The Staff of Aaron), his rival's work on the Passover Haggadah. He himself never published it, however; and after the death of Teomim wrote a marginal note on his manuscript forbidding its publication in the future. It was nevertheless issued by Jellinek in 1865 in the "Bikkurim," 1865, i. 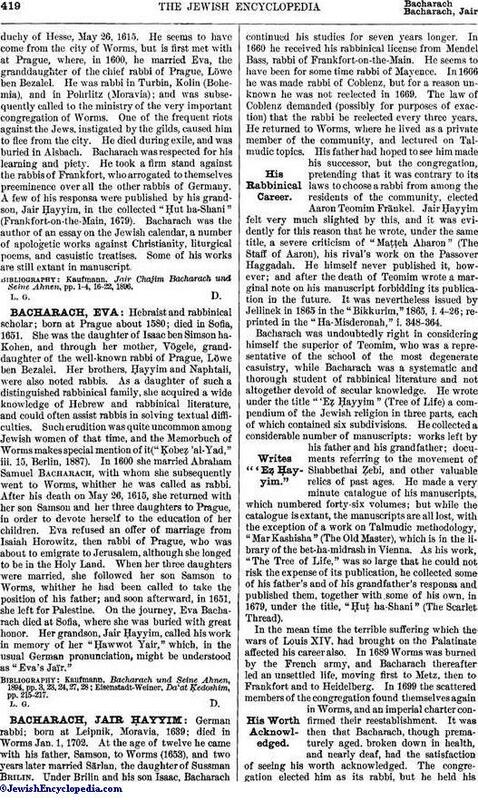 4-26; reprinted in the "Ha-Misderonah," i. 348-364. Bacharach was undoubtedly right in considering himself the superior of Teomim, who was a representative of the school of the most degenerate casuistry, while Bacharach was a systematic and thorough student of rabbinical literature and not altogether devoid of secular knowledge. He worte under the title "'Eẓ Ḥayyim" (Tree of Life) a compendium of the Jewish religion in three parts, each of which contained six subdivisions. He collected a considerable number of manuscripts: works left by his father and his grandfather; documents referring to the movement of Shabbethai Ẓebi, and other valuable relics of past ages. He made a very minute catalogue of his manuscripts, which numbered forty-six volumes; but while the catalogue is extant, the manuscripts are all lost, with the exception of a work on Talmudic methodology, "Mar Kashisha" (The Old Master), which is in the library of the bet-ha-midrash in Vienna. As his work, "The Tree of Life," was so large that he could not risk the expense of its publication, he collected some of his father's and of his grandfather's responsa and published them, together with some of his own, in 1679, under the title, "Ḥuṭ ha-Shani" (The Scarlet Thread). In the mean time the terrible suffering which the wars of Louis XIV. had brought on the Palatinate affected his career also. In 1689 Worms was burned by the French army, and Bacharach thereafter led an unsettled life, moving first to Metz, then to Frankfort and to Heidelberg. In 1699 the scattered members of the congregation found themselves again in Worms, and an imperial charter confirmed their reestablishment. It was then that Bacharach, though prematurely aged, broken down in health, and nearly deaf, had the satisfaction of seeing his worth acknowledged. The congregation elected him as its rabbi, but he held hisposition for scarcely two years, dying at the age of 64. Of his numerous manuscript works he could edit only his responsa, which he called "Ḥawwot Yair" in memory of his grandmother, Eva Bacharach. The book was published in 1699 through the assistance of the wealthy court-Jew, Samson Wertheimer of Vienna, to whom Bacharach was related by marriage. His wife dying not long after him, and his two sons, Samson and Samuel, leaving Worms for different localities, his manuscripts became scattered. Bacharach was in many ways an original thinker, and his works show a certain scientific and independent spirit. Thus in one instance he says, "Even if the Tosafists and other authorities disagree with my opinion, what of it? The spirit of God made me as it made them" ("Ḥawwot Yair," No. 155). He wrote a scholarly treatise on the meaning of oral tradition (ib. No. 192), while such subjects were as a rule foreign to the rabbis of his age. He advocated the establishment of schools and the introduction of pedagogical methods (ib. No. 123), and strongly condemned the methods of Pilpul, and the uncouth manners customary in the rabbinical disputations of his age (ib. No. 152). 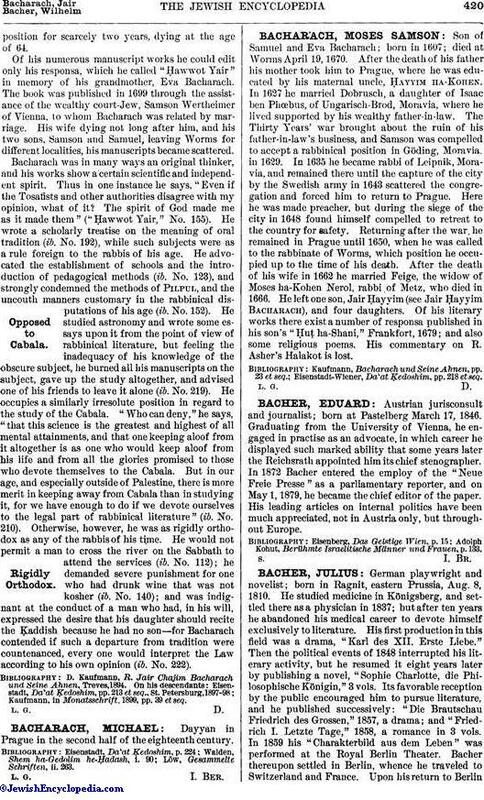 He studied astronomy and wrote some essays upon it from the point of view of rabbinical literature, but feeling the inadequacy of his knowledge of the obscure subject, he burned all his manuscripts on the subject, gave up the study altogether, and advised one of his friends to leave it alone (ib. No. 219). He occupies a similarly irresolute position in regard to the study of the Cabala. "Who can deny," he says, "that this science is the greatest and highest of all mental attainments, and that one keeping aloof from it altogether is as one who would keep aloof from his life and from all the glories promised to those who devote themselves to the Cabala. But in our age, and especially outside of Palestine, there is more merit in keeping away from Cabala than in studying it, for we have enough to do if we devote ourselves to the legal part of rabbinical literature" (ib. No. 210). Otherwise, however, he was as rigidly orthodox as any of the rabbis of his time. He would not permit a man to cross the river on the Sabbath to attend the services (ib. No. 112); he demanded severe punishment for one who had drunk wine that was not kosher (ib. No. 140); and was indignant at the conduct of a man who had, in his will, expressed the desire that his daughter should recite the Ḳaddish because he had no son—for Bacharach contended if such a departure from tradition were countenanced, every one would interpret the Law according to his own opinion (ib. No. 222). Kaufmann, in Monatsschrift, 1899, pp. 39 et seq.